George Orwell, for me was quite a household name considering how, I've always taken a very active interest in politics from a very young age, especially the politics during cold war and had particular interest in Soviet Union and the politics former Soviet States and hence, this was a name that I kept coming across, especially the two books, 1984 and Animal Farm. So, I was going on a short trip and I thought I could take a nice book for a journey and a 'light political satire' seemed very appealing and hence, I packed Animal Farm into my bag without any second thoughts. It starts with an old pig in the farm of an English farmer named Jones, called Major, inspiring the other animals to start a revolution to come out his clutches and establish a kingdom where all animals are equal, all resources are shared equally, etc. Akin to the Bolshevik revolution, they could overthrow Jones very easily, however, the problems started after driving out Jones. 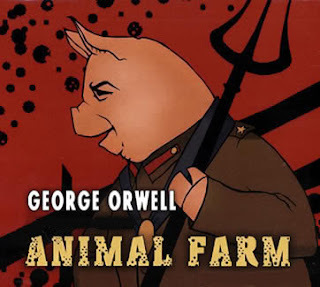 Major had passed away and the same was led by two pigs named Snowball and Napoleon, both of whom had significant ideological differences, however, came together to draft the seven commandments of the newly founded Animal Farm. However, Napoleon eventually taking control driving Snowball out of the farm (similar to the murder of Leon Trotsky and the eventual rise of Stalin). Napoleon, in my opinion, fit into the role of Stalin very well and the eventual changes in the Animal Farm was brought out very well, similar to the gradual decay of Soviet Union in the real world. However, I felt Snowball could hardly fit into Trotsky's role nor could Mrs. Jones fit into the role of Alexandra. Moreover, I felt that the writing was too flat and when you're alluding to a historic / political incident through a supposed fairy tale, I believe the writing should be filled sarcasm or at least, some blunt humour. A serious, political novel with a fairy tale involved along with animals as characters seems to be a wrong combination in every way. I guess, my fault was that I expected too much out of this book, considering how, this had been a book that I had heard of, a lot, as a classic and was in my shelf for quite a long time. The author was alluding to the Russian revolution and the eventual running of the Soviet Union along with the oppression by Stalin but then, while I could understand that, the author gave no hints towards the same in time, without this sense of immortality, this, in my opinion could well become a very sad fairy tale. However, I'd say one thing that it served my purpose of being a light read during travel, and I'd certainly try out 1984, his more popular work (well, it is on my shelf, so duty bound to read it some day). As for the rating, I would not say that the story individually was unreadable as I make it sound, but it certainly wasn't the political satire that you'd normally expect. I'd sit on the fence regarding rating this and give it a five on ten.